Will The "Taiwan Question" Give Rise To A World War III Scenario? The United States and China are set to go head-to-head over disputes in relation to Taiwan and the South China Sea, with deadly consequences on the immediate horizon. You wouldn’t know it with all the media hype over the US mid-term elections, but the US and China are on a deadly collision path in the South China Sea and Taiwan Strait. In the last two months, the US military has flown B-52 bombers and carried out its so-called “freedom of navigation” operations in the South China Sea. There have also been instances of US warships sailing through the Taiwan Strait in support of Taiwan, an island which China considers to be a rogue part of Chinese territory. On a side note, it is amazing to say the least that the US believes it should have the “freedom to navigate” in the South China Sea, yet seems to get up in arms when Iranian ships expect the same kind of freedom in the Persian Gulf. Last September, US and Chinese warships almost collided when sailing near an islet claimed by Beijing in the Spratly Islands. 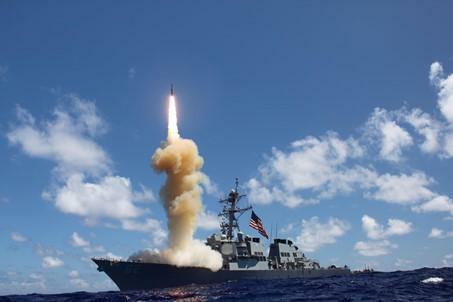 Reportedly, the Chinese warship threatened the US Destroyer that it would “suffer consequences” if it did not move, as it sailed within 45 yards of the American vessel. And of course we know how much the US loves to travel even well beyond the realms of international law, so we can expect to take Mattis at his word quite literally. Barely a few days ago, Pompeo for his part also warned China that it should “behave like a normal nation on commerce and with respect to the rules of international law” – whatever that means. Since the near-collision in September, a US Navy research ship has also visited Taiwan and two US warships have sailed through the Taiwan Strait. According to Stratfor, the US is possibly attempting to standardize patrols in the area, even potentially paving the way for an aircraft carrier group to transit through. At the end of October, China strengthened its resolve to protect its interests in Taiwan, vowing to never give up an inch of its territory. Incidentally, it was Wei Fenghe who stated that “if someone tries to separate Taiwan from China, the Chinese armed forces will take action at any price.” He also vowed the same regarding China’s interests in the South China Sea, where it has heavily fortified at least seven islands or reefs, loading them with military bases, airfields, and advanced weapons systems. Supposedly, China intends to be ready to carry out a full-scale resumption of hostilities against Taiwan by 2020. Naturally, such hostilities will likely draw in some other notable players on the world stage. At the end of October, retired Lieutenant-General Ben Hodges warned that it was likely the US and China will be at war within 15 years. Speaking about the near collisions referred to above, Hodges made the remarks, stating that: “you're going to see us … permanently assign forces for the eventuality that in 10 or 15 years we're going to be having to fight in the Pacific." Just this week, Taiwanese Defense Minister Yen Teh-fa told legislators that his government was considering allowing the US Navy access to Taiping Island if Washington requested such access for humanitarian or regional security operations, but only if Washington’s interests were aligned with Taiwan’s. Taiping Island bears incredible strategic importance thanks to its location and resources. Allowing the US access to Taiping would give the US the mobility in the South China Sea that it has been hoping for, as well as giving Washington greater leverage over countries like Vietnam and the Philippines who incidentally, also find themselves in a territorial dispute with Beijing. According to Foreign Policy’s T. Greer, a recent study by political scientist Michael Beckley and another one by Ian Easton, a fellow at the Project 2049 Institute showed that any war with China and Taiwan, even without US involvement, would be nothing short of a long, drawn-out catastrophe. A Chinese invasion would require the largest amphibious operation in human history with tens of thousands of vessels, incessant rocket and missile attacks, and at least one million Chinese troops. If a Chinese victory does not occur swiftly, it will have some 2.5 million Taiwan reservists to contend with, not to mention the likely pending Japanese and/or American counter-attack. Despite this grim reality, a recent poll found that the majority of Taiwanese people think its military cannot defend against a Chinese invasion, with less than half of respondents confident that the US would send troops to help defend Taiwan. A 2018 report by the US Department of Defense argued that China now possessed “the world’s largest and most capable maritime militia.” The Chinese People’s Liberation Army Navy (PLAN) has over 300 surface combatants, submarines, amphibious ships, patrol craft and specialized types, making it the largest navy force in the Indo-Pacific region (comparatively, the US has some 282 deployable battle force ships). Regardless, Taiwan and the US are reportedly pushing ahead with their plans to repel any alleged Chinese invasion, with military drills set for the end of November between the two already in the works. Funnily enough, the drills will most likely take place in the area around Taiping Island. Taiwan’s military is also hoping to purchase MQ-8 Fire Scout uncrewed helicopters and MK-62 Quickstrike mines from the US. Taiwan may also seek to lay these mines in its waters close to Taipei as well as other key ports and bases, a plan which eerily echoes that of Greer’s report in Foreign Policy above. People don’t need to be well-versed in international politics to see and feel the warning signs. A recent Military Times poll of active-duty troops showed that 46 percent of US troops believe the US will be drawn into a major war soon, with a focus on Russia and China in particular. Only 5 percent said the same thing in a similar poll conducted approximately a year ago. In September, the Pentagon released a 146-page document entitled “Assessing and Strengthening the Manufacturing and Defense Industrial Base and Supply Chain Resiliency of the United States” which appeared to show that the US is preparing for a large, long-term war effort against Russia and China. All the signs are there, and some countries are taking the issue more seriously than others. At the end of last month, Australia walked away from plans for a free trade agreement with Taiwan after China warned of repercussions between Canberra and Beijing. The fact that Australia was prepared to walk away should be quite telling of how important the Taiwan question is to China, with very few countries willing to challenge China on this position. One can only hope that cooler heads will prevail but for those of us who understand what’s at stake, eventually, someone will have to back down in order for there to be any chance of averting a third world war scenario. When one of those countries is the United States, the likelihood of that nation backing down and pursuing a peaceful path of diplomacy instead grows thinner and thinner.